Not too big, not too small, but very, very sparkly earrings. Lightweight and easy to wear. 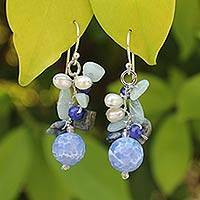 I am so glad the artist chose agates that were faceted -- this adds interest and sparkle. I also love the way she chose two stones. I will wear these a lot. Thank you! 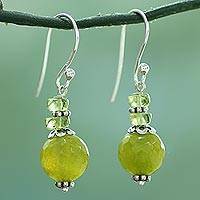 these earrings are so beautifully made ! so delicate ! i will wear them for a long tome !! thank you ! 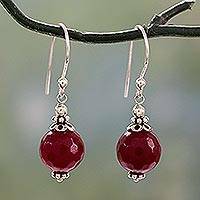 Red Agate Artisan Crafted Sterling Silver Earrings, "Glorious Red"
Globes of red agate reveal subtle honeycomb facets. 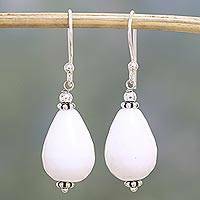 From Narayani, these earrings are handcrafted of sterling silver to showcase the lovely gems. Found all over the world, agate is a banded variety of chalcedony. Lake Superior agate is Minnesota's state gem. 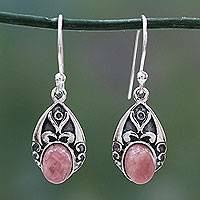 The stone's wide range of colors makes it perfect for jewelry, and the gemstone stars in Novica's Agate Earring Collection. From tan and caramel to elegant moss agate, blue lace agate, and many more types, agate finds a beautiful showcase in gold vermeil and sterling silver jewelry. 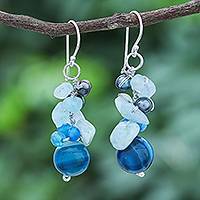 Novica presents agate earrings from talented artisans and designers around the world. Our Agate Earring Collection features styles for every occasion, from everyday classics to stunning red carpet designs. 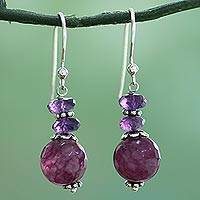 Alone or in combination with a silver necklace, pearl bracelet and earrings, or the agate and amethyst ring and earrings, agate brings color to today's fashions. Please enjoy the myriad hues of our agate earrings!